Still thrilled with CES 2016 and not sure which technology events could surprise you more in the upcoming year? We’ve made a list of top tech conferences, exhibitions and shows that everybody should visit in the first quarter of 2016. The IT Expo team did a tremendous job for you to have a great time in Florida this year. 100+ speakers from top IT companies, 120 sessions in 4 days, 5 collocated events, lots of event-related parties around the city and a great networking app to help you not just wander around the place goggling at all the new hardware and software products presented at the expo, but also have a productive networking experience with people from all over the world. This is quite a new technology event which you should visit if you’re interested in cutting-edge technologies and startups. The event’s motto is “Unicorn VS Narwhal. Myth VS Reality” and it speaks for itself. Here you can meet C-level executives from top tech companies, as well as startup teams speaking at the same stage. Eastern Europe can indeedsurprise you with lots of tech jewels that will take over the world IT community. Be sure you’re the first to see them. to know top trends in Predictive Analytics, Data Mining, Business Intelligence, Machine Learning and all the cool modern stuff, you’re welcome here. The high standard of quality is one of the main features of this event. Voxpopuli says that 92 % of all visitors rated it “good to excellent ”, and 95% said they would recommend it to colleagues. The next one in the list of Big Data technology events is Deep Learning Summit. Data scientists, developers, experts will meet there to discover all the emerging trends of this cutting-edge field. You can join group brainstorming sessions, interactive workshops and become a part of the scientific community that develops the world’s leading innovations. California is traditionally rich for the best tech conferences. But the beginning of February is all about the only event – Annual Crunchies Awards by TechCrunch. It’s one of the 2016 tech conferences that are total must- visit. TechCrunch awards the best startups of the year with its Oscars of Startups and Technology. And the Afterparty is a blast. Conference, Expo, Hackathon, Awards session, Job Board – the Silicon Valley version of a developer’s Heaven. Here you can test your software development skills and have fun with your friends and colleagues. There’s also the CTO World Congress for tech executives. Come and meet CTO of Splunk, LinkedIn, VMware and other Fortune 500 companies. SUP-X has got to our list because it doubles the number of its attendees every year. The SUP-X team declares that 47% of attendees are decisionmakers. So if you are a tech startup it’s a great chance for you to meet up with one of 250 investors present at the expo and get an offer of a lifetime. This conference has a right to be one of the top tech conferences in 2016. It’s a number one event for the Mobile Evangelists. If you want to know how mobile hardware and software will look like in 2020, you should come to MWC in 2016. MWC Facebook group already counts more than 60 thousand members – you don’t really get to see such a lot of mobile tech fans very often, do you? Let’s add some more business atmosphere to our upcoming tech events list. CeBIT is a classic version of a German event where you will always meet serious people with excellent business approach. People meet up here for closing deals and making money. Get your tickets, download the networking app and don’t forget to pack your tie. in modern world. If you’ve been to Strata+ Hadoop before, you know what we mean. If you’re new, just come and see it yourself, we’d be happy to discuss your impression on some point. There are loads of things to see in the first quarter of 2016, but it’s only the beginning. The rest of the year will fill your technology events calendar even more. Stay tuned! 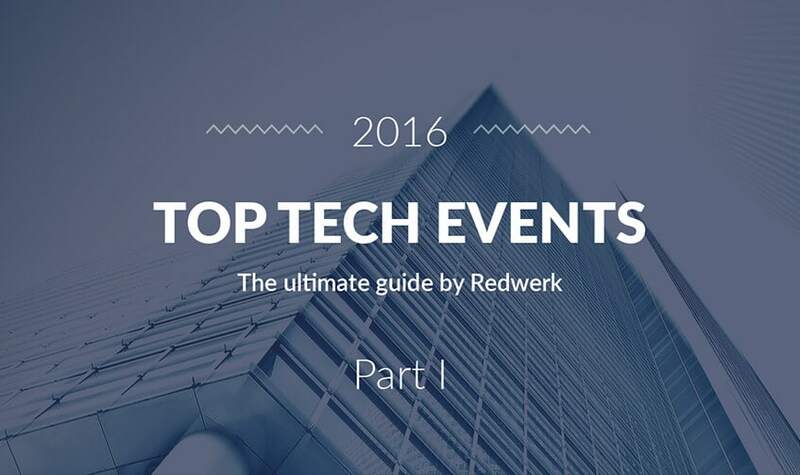 You also have to read our ultimate guide to top tech events in Q2 2016! Redwerk is a Ukrainian outsourcing company that develops software for the various businesses worldwide. We also provide software development for startups using our core technologies like Python, Java, Node.js, PHP and creating solutions for the web, iOS, and Android. Projects we accomplished for startups have already received popularity among their users.